GEIST Junior takes young players aged 4 and up on a wild journey to meet the 13 adorable Pet Geists. It is the most fun and imaginative children's game yet! 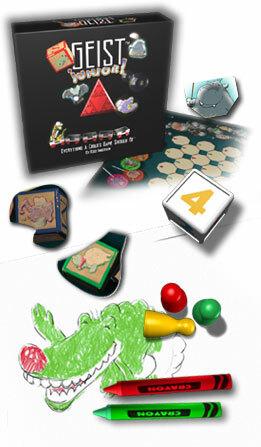 GEIST Junior is the first combination puzzle and board game, with 4 different puzzles for 4 times the fun! Play with numbers! Use the numbered spaces to hop around the board and collet Pet Geist puzzle pieces. Be the first to solve your puzzle and win! A real treat for young players! GEIST Junior has it all!